Some consumers incorrectly think that a bankruptcy pretty much ruins their credit profile for the long haul. And while a bankruptcy filing does in fact damage a credit profile the fact is it’s less of a long term impact than one might think. Don’t misinterpret here, a bankruptcy filing does severely damage a credit history but it’s not the end of the world. A bankruptcy is typically the result of some sort of life-changing event such as an extended illness and unable to work, a divorce or a death in the family. An extended layoff can also contribute but whatever the cause many find financial relief with a bankruptcy filing and gives them time to get back on their feet and right their financial ship. There are two types of bankruptcy filings for individuals, a Chapter 7 and a Chapter 13. A chapter 7 filing is a complete discharge of all dischargeable debts. Such debts are installment loans and credit cards, for example. There are certain types of debt that cannot be discharged such as taxes, spousal or child support and student loans for example. 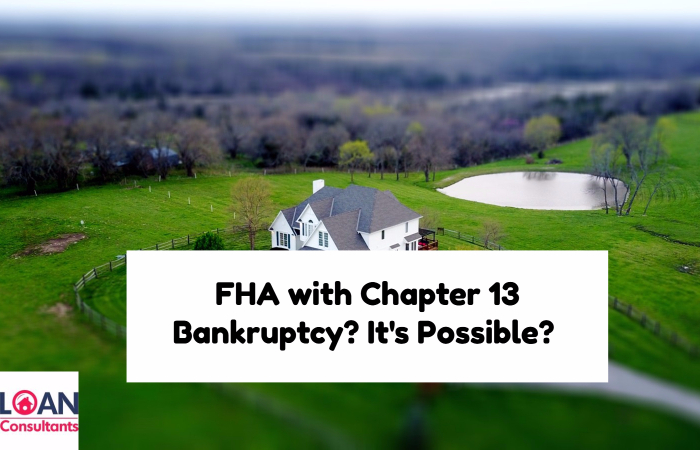 A chapter 13 filing does not wipe away dischargeable debt but instead sets up a repayment plan where the outstanding debts are paid off in monthly installments. With a chapter 13, the consumer presents all outstanding debt to a bankruptcy court and with legal assistance prepares a repayment plan that will pay the outstanding debt over a period from three to five years. The creditors who are claim outstanding debts owed to them must approve the repayment plan in addition to the court’s approval. A trustee is then assigned to oversee the bankruptcy petition including making sure the consumer provides all the necessary financial information. Once the plan is approved, repayments begin. While it’s true that bankruptcy filings are a public record and remain on the credit report for up to 10 years, that doesn’t mean someone has to wait that long before getting a mortgage. In fact, for FHA loans, the waiting period to obtain a home loan is 24 months, not 10 years. But there are a few caveats that must be addressed. It’s important to note that the Department of Housing and Urban Development, or HUD, does not require any waiting period whatsoever, but individual lenders can and do. A lender can evaluate an FHA loan application that has a recent Chapter 13 filing and review recent credit patterns. It’s also important to have the consumers explain how they got into financial straits and why the bankruptcy filing was the only option. Typically this means providing copies of medical bills, unemployment compensation or other third party documentation that would provide grounds the situations causing the filing was out of the consumer’s control. Today, mortgage loan applications are submitted and approved electronically. A consumer fills out an online application or completes an application in the presence of a loan officer. The loan officer then uploads the electronic file for an approval. The approval process is almost instantaneous and reviews FHA loan requirements and compares them with what appears on the application including income, assets, employment history and other important factors. Credit scores are also evaluated. Yet in the event of a recent Chapter 13 discharge, where the repayment plan was completed successfully, the lender will manually underwrite the loan and not submit the electronic file. When a loan file is manually underwritten it is up to the lender’s discretion whether an FHA loan merits an approval. Once the borrowers provide evidence the circumstances leading up to the filing was out of their control, the lender wants to see a perfect credit history since the filing. This means timely payments under the Chapter 13 repayment plan. Rental or mortgage history over the previous 24 months will be reviewed. The lender wants to see other positive factors in the file that will warrant an approval. For example, someone who has been at the same job for 10 years is a positive factor. So too can a higher down payment than the minimum 3.5% FHA requires. These positives are referred to as “compensating factors” and weigh heavily on the lender’s decision. Okay, but what if someone is currently in a Chapter 13 repayment plan, must that individual wait until the bankruptcy has been discharged and the repayment plan successfully retired? FHA guidelines do make an allowance for someone currently in a Chapter 13 as long as there has been one year passed since the filing. But again, this will take some documentation on the borrower’s part to convince the trustee to accept the purchase. Before an FHA loan can be approved after just one year, the trustee has to give the okay. The most important factor will be timely payments made, especially as it relates to the repayments. If there is just one payment made over the previous 12 months more than 30 days past the due date, the lender won’t approve the loan. Current rental payments will also be verified with copies of cancelled checks showing timely rent made over the past year. And this is key here, a rental history must be verified. Many who experience such financial stress might seek the shelter of living with a family member rent-free while their credit is being repaired. However, lenders want to see a verified rental history and living rent-free, however short the period, does not fulfill the 12-month rental history requirement. The minimum credit score must be 580 and if there are two borrowers on the application, the lowest of the two scores will be the qualifying score. Any other credit accounts opened and used over the past year must also show a timely history. It cannot be stressed enough that just one credit “hiccup” can derail an FHA loan application while currently in Chapter 13 repayment period. There are several hurdles that must be met in order to get an FHA loan during or after a Chapter 13 and many borrowers aren’t ready to jump back into homeownership so soon. Yet for those that do want to own again and begin rebuilding their credit history, they can do so with an FHA loan sooner than they might have thought.